Now European. 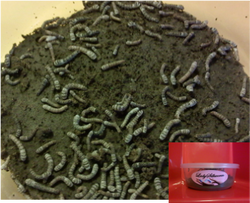 Perfect to grow your silkworms larger. Purchase a piping bag for easier hands free contamination free application. These are indeed more consistent, produce more than 2 lbs, and last longer due to added anti-microbial agent. Also available are ready made chow bags. Please go to mulberry chow page for shopping cart on these additional products. $11 each. Email for quantities. Please email me directly at ladysilkworm@gmail.com and let me know what size, quantity and approximate date desired. We also deliver to local customers and pick ups are available on prepaid orders.